If you are reading this, you are likely to feel that there is more to life that what your current career is offering you. 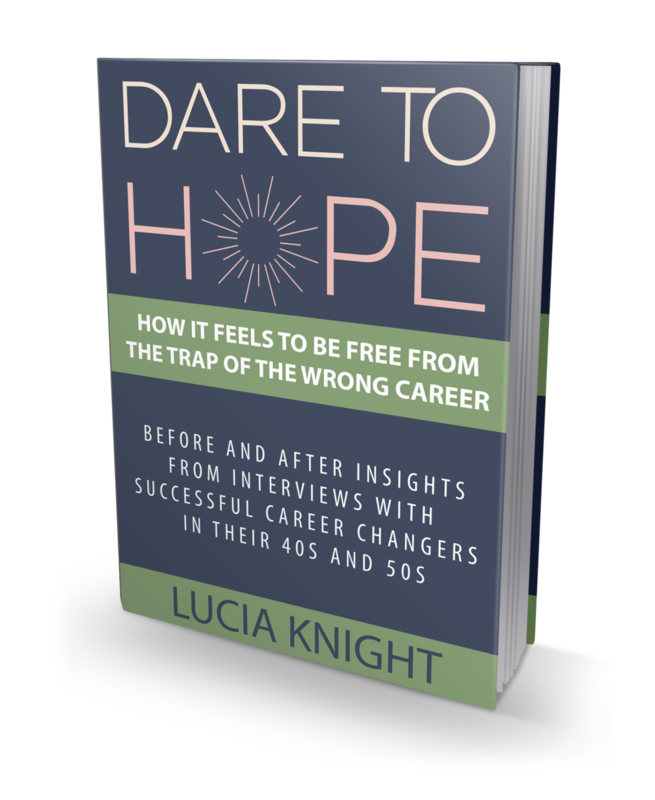 It might help to know that you are not alone - in fact 90% of people in their 40s and 50s don't take the time to investigate whether their current career is sound enough and enjoyable enough to last another 20 years. You sit in the other 10% who are lifting their heads up from the daily grind and wondering what else is out there. they often have experienced a recent difficult event in their personal lives (e.g. personal health scare, elderly parent's illness or a partner being made redundant) which has triggered deep thought about their future. they very simply want more from their career...more satisfaction, more challenge and more enjoyment. If you are just beginning your thought process, have a look at the articles in my blog but also sign up to the midlifeunstuck.com newsletter (below) so that I can send you my Beginner's Guide to Successful Career change - even if you don't know where to start ebook. It includes clear, actionable steps which will jump-start your midlife career change. You'll also get feisty, honest book recommendations and other tips that will help you start your journey towards more fulfilling work. I am Lucia Knight. I am a mid-lifer who has gone through several career transformations so I know a bit about them. I have moved countries several times after leaving my childhood home in Northern Ireland. The first decade of my career was spent helping individuals to find similar jobs in different companies. The next decade was spent hunting down the perfect new board member for growing or transforming companies across South East England. After a couple of years of feeling progressively "career stuck", my mid-life found me diving headlong into a Psychology Masters. This included researching how personality influences work and life satisfaction (some people call this "happiness") and a major research project into the future for over 50s in big corporates. My conclusions from this learning changed my career and my own life satisfaction at the same time. I now combine my head-hunting, management, coaching and psychology experience to guide mid-lifers through career transformations. Outside of work, my husband and I have two feisty (Celtic genes) and sensitive daughters who keep us busy. I adore the Desert Island Discs radio show and am working my way through every episode ever recorded since 1942. To make me feel alive, once a year I help organise a group challenge which is always way beyond my physical capability. I'm usually at the back of the pack during these 12 hour challenges...until I spy the celebration drinks lined up at the bar! I'm also a volunteer for Cruse Bereavement Care. If you would like access to resources to lead your own career transformation delivered to your private inbox, please sign up to my newsletter below. If you'd like to have a conversation about how I might be able to help you, email me at lucia@midlifeunstuck.com to arrange a time to confidentially discuss your situation. Interested in my "You're not too old & it's not too late" career change insights twice a month? Thank you! Your newsletter will be winging its way to you as soon as its ready. I've thrown in my Where to start book which is a beginner's guide to career change in your 40s or 50s. I hope you like it. If you have any problems - just drop me an email to lucia@midlifeunstuck.com and I'll send it to you direcctly.